Yesterday, I stopped by Piece of Cake's location in downtown Decatur. I was disappointed that my phone was dead and my camera didn't have an SD card in it, so I couldn't take any pictures until I got home. [Food bloggers should always be prepared take photos.] 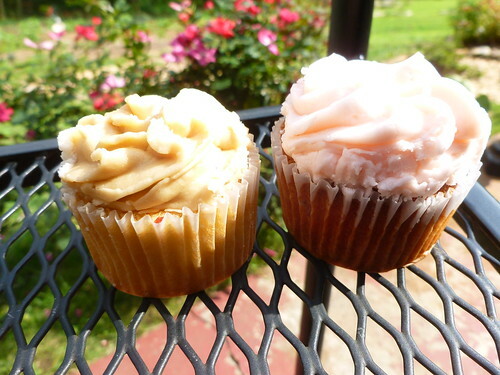 I got a pair of delicious cupcakes, strawberry and a caramel. Piece Of Cake has both small and large cupcakes. The small cupcakes (pictured above) retail for $2.50 and the large are $2.95. There are six locations in the Atlanta area and they also deliver.